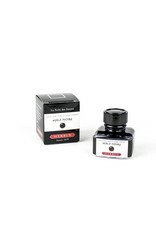 This 30ml glass bottle of Herbin Perle Noire black fountain pen ink is elegantly labeled and has an integrated pen rest. Herbin ink is non-toxic and pH neutral, water based, flows smoothly, and uses all natural dyes. Perle noire (Black Pearl) was the black ink was the first created by Herbin, with an exceptional quality. He gave it the name "Perle Noire" for its preciousness.